The Swiss Heart Foundation is celebrating its 50th anniversary. The special stamps are not just aimed at a wide public, but also at those directly affected, their families and the authorities. Cardiovascular disorders number among the most prevalent diseases of modern society and are the number one cause of death in Switzerland. As the population grows older, the number of patients increases. One of the Foundation’s main objectives is to promote a lifestyle conducive to a healthy heart. This includes a balanced diet, getting sufficient exercise, and not smoking. 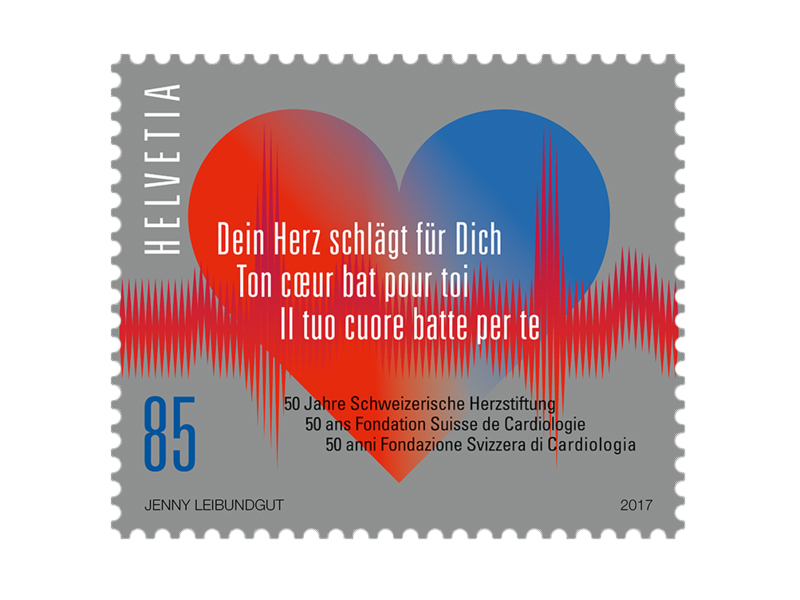 The special stamp designed by Bernese graphic artist Jenny Leibundgut Riggs shows a symbolized heart in the colours of the blood circulation system with stylized pulse sound waves running across it. Lending a scientific undertone, the shining silver background stands for research, another of the Heart Foundation’s areas of activity.